Can't keep your kid in bed? Let us help with that. MELLA is the all-in-one children's clock and sleep trainer designed to keep your kid in bed longer. When your kid sleeps, so does MELLA. Set the desired sleep time and every night, MELLA will go to sleep with your kid. MELLA sleeps through the night so your kid knows to stay in bed. Half an hour before the wake time, MELLA will display a playful expression and glow a yellow light. Teach your kid to play quietly and wait patiently until the light turns green! When MELLA turns green, it's time to wake up! 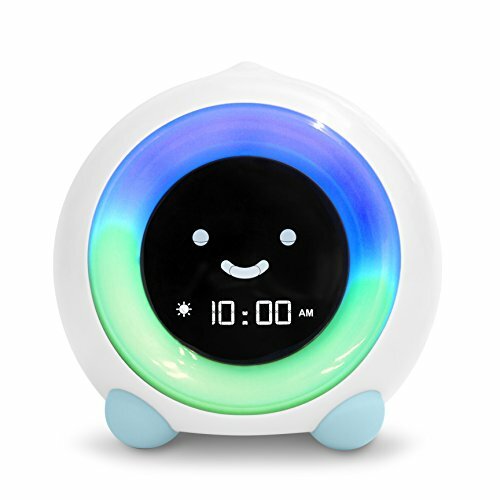 Set the desired wake time and MELLA will greet your kid with a smile and glow green. It's time to start the day! Each Little Hippo purchase comes with a 100% Satisfaction Guarantee and one year warranty. If you are not happy or if you need support, please contact our support team! ☆ PATENTED, BEAUTIFUL DESIGN - A runaway crowdfunding success, MELLA has been featured in publications such as Mashable and Yanko Design for its numerous features and modern design. Who says children's products can't be beautiful too? ☆ KEEP YOUR KID IN BED LONGER AND GET MORE SLEEP - MELLA uses colors and facial expressions to teach your kids when it's time for bed and time to wake up. Half an hour before it's time to wake up, MELLA will glow yellow, signaling it's almost time to start the day. When MELLA turns green, it's time to wake up! ☆ ALL-IN-ONE SLEEP GADGET GROWS WITH YOUR CHILD - MELLA also features three sleep sound options and five night light colors to soothe your child to sleep. MELLA also features three alarm sounds and both an alarm and silent countdown for timed activities for older children. ☆ DURABLE AND SAFE CONSTRUCTION - Comprised of child safe ABS and silicone, MELLA is FCC, CE, RoHS, CA65, REACH and CPSIA approved. ☆ 100% SATISFACTION GUARANTEE AND ONE YEAR WARRANTY - Little Hippo stands behind its products. If you are not happy, contact our customer support team! If you have any questions about this product by LittleHippo, contact us by completing and submitting the form below. If you are looking for a specif part number, please include it with your message. Vintoys Very Soft Cat Big Hugging Pillow Plush Kitten Kitty Stuffed Animals Gray 23.5"